Alan had a choice to make. He could either do nothing but feel sorry for himself when his wife sadly passed away, or he could seize life with both hands and move ahead with his plans to buy a liveaboard narrowboat. A year later he’s continuously cruising the inland waterways network with his rescue border collie. I am Alan and I live on the boat with my best friend, James – a rescue border collie about a year old, who I have had for 3 months. After my wife died last year I had a choice. I could sit at home feeling sorry for myself or decide to get on with the rest of my life. I chose the latter and started my search for a live-aboard boat. The research, searching for a boat and buying it are what kept me going through the first few months. 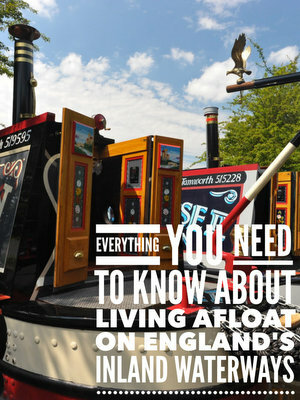 We had been on many boating holidays and I knew I would love the life. Lucy Lowther, already the name when I bought her. 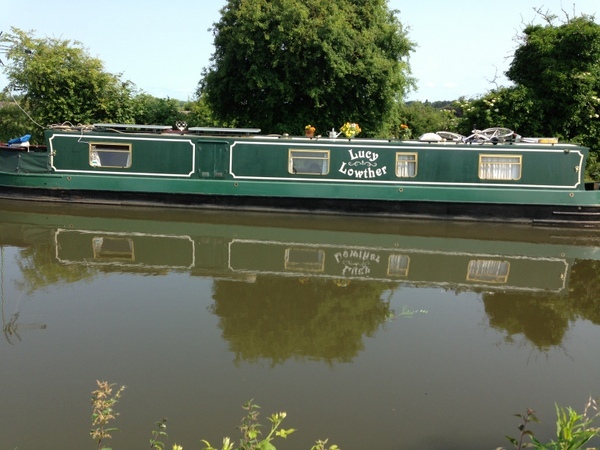 I was going to rename her after my late wife but, if I take to the boating life, I suspect I will want to upgrade when I sell the house – an extra few feet, a larger shower and maybe not a cross bed. I will rename the new boat or this one, if I keep her, when next repainting but in my mind she will always be “The Lovely Lisa”. No mooring, although I have just booked a winter mooring. to enable me to get my house ready for sale next Spring. I will buy a smaller property and may or may not live on the boat in the winter months. I bought the boat in December last year and moved on board in March. All the time since March, apart from the occasional few days checking on the house. Retired. Previously in finance, then a village shop and post office. The inability to “jump in the car” to pop to the shop for something you need. My worst experience so far was nothing horrendous but the section from Wigan to Burnley was not enjoyable. From empty pounds to too much water threatening to engulf the boat and lots of local youths hanging about, including two on the stern to snort a line of cocaine (I engaged with them all and had no problems and several helped with gates). Being able to just turn the key and move my home to a new place to explore, with new views and experiences and seeing the country at 3 mph. That may be three things! I love the scenery, the camaraderie and friendship too. The shower – it is tiny. A shopping trolley, a rucksack and very occasionally the bike. I have a compact Candy washing machine. Works great. Dump-through pump out and I would not swap for anything else. If I live onboard in the winter I may buy a porta-potti or similar as back up in case the canals are iced in. Usually tethering with 3 on my iPhone. Unlimited download for £18 per month, as well as 2000 minutes and 5000 texts. Service generally very good. I have a back-up dongle, also on 3, which I can hang on my 10ft aerial mast if reception is poor but will probably change this to a different provider to avoid the duplicate coverage. Well, I have not covered them all, by any means. So far, it has to be the Leeds & Liverpool. from Foulridge to Skipton. Oh, and the Llangollen. Or perhaps the Weaver. And what about the Montgomery? Yes, it has to be the Monty but perhaps only because I had some fantastic dawn cruises on there. Obviously mostly from the engine. But when I am not moving I have 400w of solar panels. On a sunny day I do not need to start the engine. If it is cloudy the panels will supply my needs but not replace the previous nights use. I am a heavy electric user. The boat did not have a stove when I bought it. The gas central heating only just kept the boat warm enough when it was not very cold – and used a bottle every 3 days. The 4kw stove I had fitted kept the boat plenty warm in a very cold March. What are the things you miss most compared to living in a house? The power shower, opening the back door to let the dog out and being able to walk from one room to another. Do it. But if you are a couple or a family you have to be sure you can live with each other in close confines with little escape – maybe try a few weeks in a caravan first. You can read Alan’s excellent blog here. He updates it regularly and adds plenty of photo’s. It’s well worth a read.